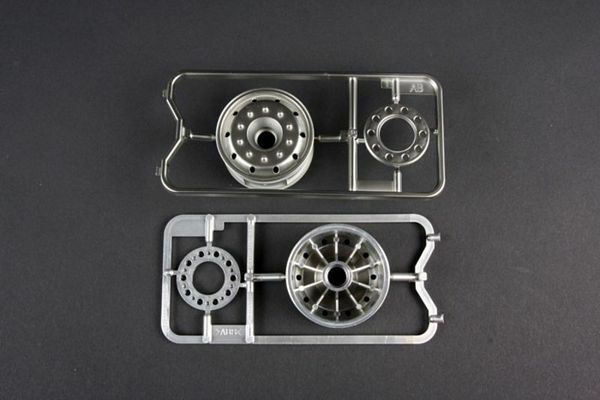 Tamiya 56520 a pair of Semi Truck Metal Plated Wheels from Taimiya. 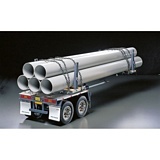 Actual tractor trucks are often seen with plain natural-metal wheels made of steel or aluminum. To depict this type of wheel, these matte finish metal-plated wheels for 1/14 scale R/C tractor trucks and semi-trailers are available as an option accessory. By simply replacing with kit-standard gloss finish metal-plated wheels, you can give your truck or trailer a different appearance. 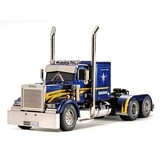 This is a 1/14 Scale Tractor Truck by Tamiya which is a VERY Scale Kit. 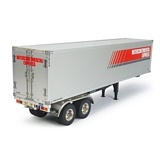 The semi trailer is Not Included in this kit, but is available separately. 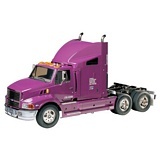 This is the 1/14 scale TamiyaSemi Trailer Kit. The Tractor Truck is not included. 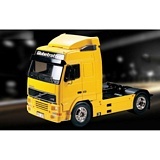 This is the Flatbed Semi-Trailer kit from Tamiya. 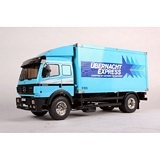 It is for use with the Tamiya 1/14th scale tractor trucks, such as the King Hauler, Mercedes-Benz, or Globe Liner. 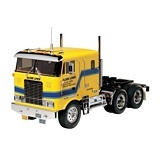 This is a 1/14 Scale Tractor Truck by Tamiya which is a VERY Scale Kit. This is the electric powered, radio controlled, 1/14 scale Tamiya Ford Aeromax Tractor Truck Kit. This is the 1/14 scale Tamiya Pole Trailer Kit. The Tractor Truck is not included. This is the electric powered, radio controlled, 1/14 scale Volvo FH12 Globetrotter 420 4x2 Tractor Truck kit. RC Freightliner Cascadia Evo. 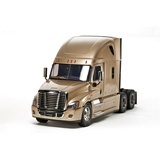 The Cascadia Evolution is an aerodynamically advanced and more fuel efficient version of the Cascadia tractor manufactured by Freightliner Trucks, a leading manufacture in the North American market. 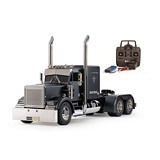 This R/C model assembly kit of the Cascadia Evolution faithfully recreates the truck's fuel efficient form and includes a number of metal chassis parts. The highly aerodynamic form of the Cascadia Evolution was accurately captured thanks to extensive research and cooperation from Freightliner/Daimler. The model also features accurate interior details such as dashboard and seats. Gloss and matte finished metal-plated parts further heighten the model's realism. 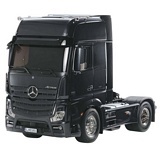 Tamiya electric powered, radio controlled, 1/14 scale Tamiya Mercedes Benz Actros 1851 GigaSpace Tractor Truck kit. 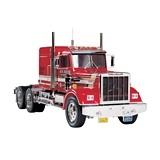 Compatible with the Tamiya Tractor Truck Option Parts for further customization. For modelers 14 years of age and older. Tamiya electric powered, radio controlled, 1/14 scale Tamiya The Grand Hauler resembles a classic customized american tractor truck. The included 540 motor drives a 3-speed transmission, which has no problem turning the dual rear axles. 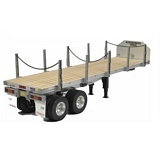 Leaf spring and shocks keep the axles suspended to the metal C-Channel ladder frame, which keeps the power to the pavement. 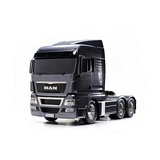 Tamiya a special edition of Item 56325 MAN TGX 26.540 6x4 XLX. The cab, F, H, K, M and CC parts of the kit have been molded in Gray and pre-painted in Gun Metal (Tamiya Color TS-38) for a cool look, with a durable coating applied to protect the paintwork from damage. 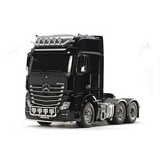 Tamiya electric powered, radio controlled, 1/14 scale Tamiya Mercedes Benz Actros 6x4 3363 GigaSpace Tractor Truck Kit with Body Compatible with the Tamiya Tractor Truck Option Parts for further customization. This is the electric powered, radio controlled, 1/14 scale Tamiya Grand Hauler Black Edition Semi Truck Kit.